One of my favorite football players of all time, and that was even before he played for the Seahawks. Congratulations on making the Hall of Fame. As you can tell from the picture, Randle liked the eye-black, and I am a little disappointed that the NFL didn't have it on his bust... Here is a video of him getting ready for the season. Look at that, two Seahawks in one Hall of Fame class! 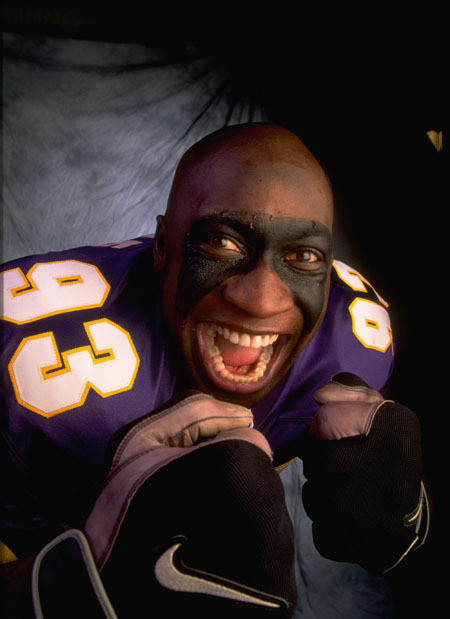 (snicker) John Randle, and Jerry Rice... Randle joins the other great Seahawk defensive HoFer Carl Eller (Hello Minnesota!). The other Seahawk HoFers are Steve Largent, Warren Moon, and Franco Harris (heh, We get him in exchange for the 2006 Superbowl XL trophy). All joking aside, we get to claim Moon, as he has tight ties to here (Huskies, broadcasting), and the Oilers no longer exist.